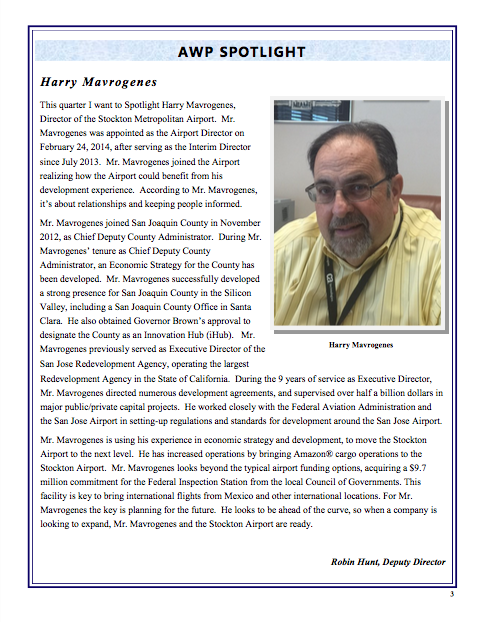 This quarter I want to Spotlight Harry Mavrogenes, Director of the Stockton Metropolitan Airport. Mr. Mavrogenes was appointed as the Airport Director on February 24, 2014, after serving as the Interim Director since July 2013. Mr. Mavrogenes joined the Airport realizing how the Airport could benefit from his development experience. According to Mr. Mavrogenes, it’s about relationships and keeping people informed. Mr. Mavrogenes joined San Joaquin County in November 2012, as Chief Deputy County Administrator. During Mr. Mavrogenes’ tenure as Chief Deputy County Administrator, an Economic Strategy for the County hasbeen developed. Mr. Mavrogenes successfully developed a strong presence for San Joaquin County in the Silicon Valley, including a San Joaquin County Office in Santa Clara. He also obtained Governor Brown’s approval to designate the County as an Innovation Hub (iHub). Mr. Mavrogenes previously served as Executive Director of the San Jose Redevelopment Agency, operating the largest Redevelopment Agency in the State of California. During the 9 years of service as Executive Director, Mr.Mavrogenes directed numerous development agreements, and supervised over half a billion dollars in major public/private capital projects. He worked closely with the Federal Aviation Administration and the San Jose Airport in setting-up regulations and standards for development around the San Jose Airport. Mr. Mavrogenes is using his experience in economic strategy and development, to move the Stockton Airport to the next level. He has increased operations by bringing Amazon® cargo operations to the Stockton Airport. Mr. Mavrogenes looks beyond the typical airport funding options, acquiring a $9.7 million commitment for the Federal Inspection Station from the local Council of Governments. This facility is key to bring international flights from Mexico and other international locations. For Mr. Mavrogenes the key is planning for the future. He looks to be ahead of the curve, so when a company is looking to expand, Mr. Mavrogenes and the Stockton Airport are ready.